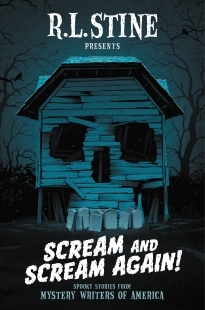 Read my latest short story, “The Platform,” in Scream and Scream Again, A Collection of Short Stories edited by R. L. Stine! What a blast this book is! Each story begins or ends with a scream. Except for mine, which begins and ends with one. (Mainly because I can’t follow directions.) R.L. Stine—the godfather of Goosebumps—and some of the most popular authors today bring an unrivaled mastery of all things fearsome, frightening, and fantabulous to this terrifying anthology of all-new scary short stories. With twenty never-before-published scary stories from some of the most popular authors today. So I get to rub shoulders with the likes of Chris Grabenstein, Wendy Corsi Staub, Heather Graham, R.L. Stine, Bruce Hale, Emmy Laybourne, Steve Hockensmith, Lisa Morton, Ray Daniel, Beth Fantaskey, Phil Mathews, Carter Wilson, Doug Levin, Jeff Soloway, Joseph S. Walker, Alison McMahan, Daniel Palmer, Tonya Hurley, and Stephen Ross.